Once upon a time, we used the phone to invite people to meetings, but e-mail and electronic calendars like the one on your iPhone have changed that. 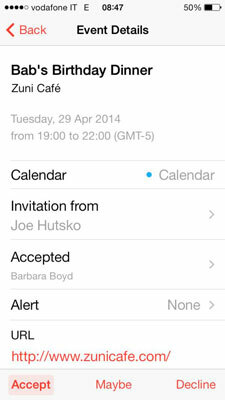 You can receive and respond to meeting invitations on your iPhone if you have enabled calendars on Microsoft Exchange or iCloud. Notification box: An alert beep sounds and a notification box gives you minimal details about the event and the choice to close the box or view the complete details of the event. You can turn New Invitation Alerts off in Settings→Mail, Contacts, Calendar→New Invitation Alerts. On the Calendars screen: A numeric alert badge appears in the inbox on the lower right corner. On the Home screen: A numeric badge appears on the Calendar button. Accept: This puts the meeting on your calendar at the indicated date and time. Your name is added to the list of attendees. Maybe: On both your calendar and the sender’s calendar, the meeting appears tentative if you select Maybe. Decline: This sends a response to let the person know you won’t be attending. Nothing is added to your calendar. The invitation is deleted from your iPhone unless you switch on the Show Declined Events option on the Calendars screen. This is a good option because you can go back and accept an invitation if you change your mind. If you receive an invitation in an e-mail, it shows up as an attachment with an .ics suffix, which indicates the iCalendar standard. Tap on the attachment and the Event Info screen opens. You can then add the event to your calendar and respond.